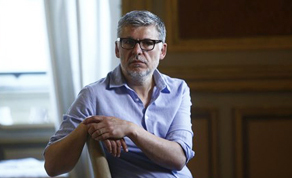 IFTN caught up with Irish Director Paddy Breathnach ahead of the launch of his new feature film ‘Rosie’, which many critics are claiming to be the most important Irish film of the year. Debuting at the Toronto International Film Festival in September and having opened in Irish cinemas on Friday, ‘Rosie’ makes its UK premiere to a soldout crowd at the BFI London Film Festival this Monday, October 15th. Paddy Breathnach (‘I Went Down’, ‘Viva’) directs ‘Rosie’, a film that explores the quietly apocalyptic ramifications of Ireland's housing crisis, from a screenplay by Roddy Doyle (The Commitments, The Snapper) and starring Sarah Greene (Penny Dreadful, Rebellion, Black 47) in the title role, alongside Moe Dunford (Vikings, Handsome Devil) as her partner John Paul. ‘Rosie’ is produced by Element’s Emma Norton, Rory Gilmartin and Juliette Bonass. Roddy Doyle serves as Executive Producer alongside Ed Guiney and Andrew Lowe for Element Pictures, who previously brought us The Lobster and Room. Dearbhla Regan is executive producer for Screen Ireland. IFTN: Congratulations. This film is coming out at a really important time, isn't it? The timing has been very fortuitous on it. Paddy: “Yes, it’s almost that at this time of the year it becomes more pertinent and important. Equally, while we were going through development, there were periods where we were thinking, although maybe naively, ‘Will this be sorted?’ Because there was an issue but the government was saying a couple of years ago, that nobody would be staying in hotels by July 2017. IFTN: Tell me a little bit about casting Sarah and Moe? Paddy: “Very early on, they were both on the list. The Moe list, the John Paul list, was a short enough list, and Moe was in my mind very early on because he has a great almost bear-like quality, which I felt for was great for John Paul - something very solid and steadfast, but warm. I felt that he would work really well for that. He was in my mind early on. “Sarah was in my mind but because of the role and the importance of it, I felt I needed to really go wide and see lots of different people. When you're casting, the first time you start making the film almost, you'd start hearing the words back and it really lets you begin to recalibrate and define, a little bit more, what you want and then you react to it a little bit. I saw a lot of people and I didn’t audition Sarah. I knew that I would be at some stage but I'd leave it till the end. Then, she sent a tape in and it was just immediately clear that she had the two things that I really wanted, which was the tension between a sort of strength and a drive, and a dogged strength, but equally, somewhere in that, a brittleness and vulnerability. “That tension between those two things, she carried really well and understood immediately. It became clear to me that she was going to be a great Rosie. As a matter of fact, both of them, aside from being great actors, brought something else that was very important because it’s a film with children and it plays in an ensemble way, I knew that I had to create an atmosphere and I needed actors who could help me with that, and also, at times, be a presence. IFTN: And amazing collaborative work with Cathal. He's such a talented DOP and you'd obviously worked with him before on Viva. IFTN: I'm sure that was absolutely vital to it because the set was so small. So much was filmed in the car and on corridors, so that must have been absolutely vital? IFTN: Was it your first time working with Úna (Ni Dhonghaile), the editor? IFTN: Was Roddy Doyle involved? Was he on-set much? ‘Rosie’ released in cinemas nationwide – Friday, October 12th.